After the end of World War I, large numbers of aircraft were removed from armed service and scrapped, as the concept of a new world 'without wars and violence' entailed minimal levels of weaponry (including aircraft) in the victor countries. The Royal Air Force rid itself of a huge proportion of its inventory because in peace time conditions just to maintain and to operate this fleet was impossible. During the same period the seeds of commercial aviation were germinating and a great future was foreseen for passenger carriers. All kinds of airplanes, mainly the former bombers, were rebuilt as transport and passenger planes. One such was the D.H.9 bomber which, while it had not won much glory for itself in combat, presented a sound basis for conversion for civilian use. And so the work was undertaken by deleting the various armament fixtures; the Scarff ring and machine guns, bomb bay and carriers and ammunition supply. This freed up space for the provision of seats for two and later three passengers, some being protected by a fuselage canopy from bad weather. The pilot as before was still in an open cockpit. The first flights took place soon after the signing of the truce. Some planes of this type were bought by the new Dutch company KLM which in the future would be one of the leaders of the air industry. Other planes were delivered to various private companies in Great Britain. During operation of the airplane problems arose from some construction defects, which were mainly connected with the change of the center of gravity as it was adapted for passenger carrying. To eliminate them, the biplane box was slightly rejigged and the pilot's position was moved, allowing an improvement of stability in flight. Many planes of this type were sent to the British Empire's dominions - Canada, Australia, and South Africa. They were used there for a long time, the last one only finally scrapped due to complete disrepair in the late 1920's. The intensity of their exploitation is shown by the fact that merely in the years 1922-1923 planes of this type flew in total more than 150,000 miles. The last planes of this type, by then unsuitable for passenger use but still used for some postal traffic, were retired in 1936. 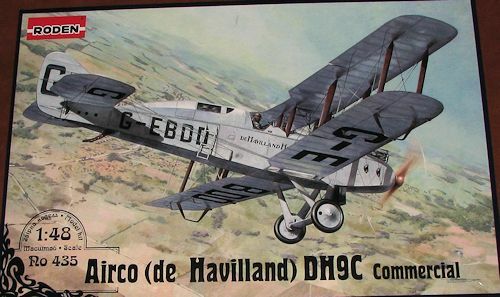 I can see that Roden is going to be doing a full run of DH.9s in addition to their extensive DH.4 line. It makes sense to do both types as so much of the airframe is the same between the two aircraft. Though a rather simplistic way of stating things, one only has to provide those specific bits germane to the type being kitted. Well, Roden goes by the theory of 'include all the sprues that have the bits we need for this version' and that means a lot of spare parts. The civil version is a good one to kit as the type is interesting and appeals to those who like something a bit different. Like other Roden WWI aircraft, this one includes a full engine and exhaust stystem. 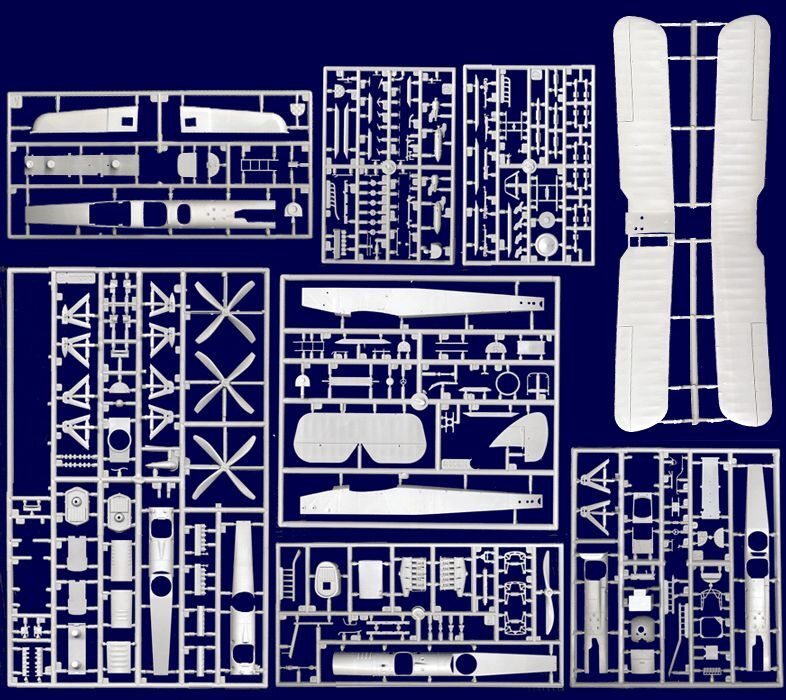 The fuselage is built of three major pieces. There is the side sections that also include the lower fuselage. The upper fuselage is a major difference from other DH.9s. This is the one that includes the enclosed section for two passengers. No in-flight service with this one, just a pair of wicker seats. There are actually four seats with another open seat right behind the very front one. Usually the pilot flew from the second seat, and that is where the control stick and rudder pedals are located. The instrument panel fits into the upper fuselage section. For the windscreen and passenger windows, an acetate sheet is included. These aircraft have separate wing and interplane struts so keeping everything level will be paramount to having a proper build. I am sure many will devise a jig of some sort. The exterior boarding ladder is included as are separate control surface bellcranks and the lower wing skids. The instructions provide a complete rigging guide that includes control surface rigging. It will make for a very busy, but very cool looking model. Instructions are well drawn with Vallejo paint references. This one is basically an overall silver dope a operated by de Havilland Hire Service in 1922. The decal sheet is well printed and typical of the day, contains very large registration letters. I have to say that I like this one. It is a bit quirky and quite a nice difference from the usual warplanes. It will take some skill to build and rig, but the end result will be quite impressive.